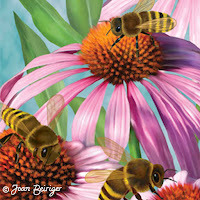 Joan Beiriger's Blog: Editorial by Jeff Grinspan: Is Art Licensing DEAD? Editorial by Jeff Grinspan: Is Art Licensing DEAD? The economy is limping along, there are fewer retailers than ever before, fewer manufacturers AND a blatant commodity oversupply. Bring in the paddles! CLEAR!! Oh and by the way, in a tight economy, retailers get very conservative. And consumers look for the tried-and-true comfort art, as they say. The historical formula for robust, profitable art licensing used to be something like this- Advance ($) + guarantee ($$) + royalty ($$$) - advance ($) = ‘a nice living’. Today, licensees are paying the lowest advances possible (some not paying any at all), the word ‘guarantee’ has been pretty much eradicated from licensing vernacular and with added pressures from retails intent on keeping their margins high, licensees keep pushing for lower and lower royalties. Is anyone making any money??? Say you are a successful manufacturer who uses licensed art. It wasn’t too long ago you had to attend trade shows or have someone send you a portfolio for review. Today? ‘Googlize’ roosters or coastal or snowmen and you’ll have 1,000 + images at your monitor with the click of a mouse. How is any artist to compete with the selection and ease of finding new art theses days??? Grim you say. Heretic! Pessimist! Naysayer! Not really. There is no doubt licensing your art in 2012 and beyond is more challenging than ever before. But, despite all the questionable vital signs, weak pulse, pasty look and irregular ‘artbeats’ . . .
maybe it’s not as bleak as I’ve made it out to be. Okay so let’s address the death knells one by one. Yes, the economy is still weak. Yes, the hit we took in 2008 resulted in a retailer fall out and manufacturer shake up. But the result was it forced those remaining to be more efficient and to commit to their survival. The need to entice wary and cost conscious consumers to purchase goods became critically important. How do you do that? If you are a retailer, you have to carry merchandise that is fresh and appealing. Only new designs and creative thinking on the part of artists delivers that kind of result. Retailers will always need new art on product. And manufacturers are the ones to supply new product. So be creative, prolific and attune to today’s trends. More so now than ever before. Okay, it’s unavoidable. The model has evolved and yes, guarantees are scarce. But historically if you were not a brand name designer you really could not get significant guarantees. Advances, while putting dollars in your pocket UP FRONT are deducted from your future royalty payments, so guess what? Your initial royalty checks sans advance are gonna be ‘bigger’ - same total dollars but you get it later than sooner (all things being equal). And while there is no empirical data to support the mathematics of fewer retailers but same number of customers (hey, we all still gotta shop somewhere right?) = great royalties, some things do change. But here is where ‘the will to live’ has to kick in. Expand your search to new categories of product for retailers that ARE successful despite the economy- specialty stores like Crate and Barrel or The Container Store, online e-tailers like Ballard Designs or Home Decorators, and specialty retail markets like surf shops or pets. What you may end up giving up in lower royalty percentages may be offset by higher volume of product in a broader base of customers for licensees. • If you can’t beat ’em, join 'em. The Internet should be a marketing tool for you. Yes, your prospects are going to search for new art. So drop the lament and make absolutely certain your SEO is tweaked to capture as much interest as possible. Be relevant! Make sure your website is well populated with art that shows your strengths, your style and your willingness to be in the game! Okay, so art licensing is not dead. We’re not even in the emergency room. There’s no epidemic or plague. We just need to take some time to re-examine our overall health, regain our strength, build our endurance and assess our ‘art licensing nutrition TM’. There’s plenty of opportunity still out there alive and kickin’! Dear Sir, Thank you so much for being informative. As a fastidious fine artist, I would also love to get into the licensing business. Please let me know if you woul be interested in further discussions. I have to agree about the licensing industry. I have tried to get representation for the past few years. Most agents are not taking on new art very much these days. I know one licensing artist who has not had any work in sometime. Always love to hear what Jeff has to say! Thanks Jeff, you rescued it in the end there, I was worried! Haaaa Good Read! OK- I'll step away from the cliff! Thanks for the inspiration, Jeff.